I just received a box of some new and improved sommelier tools. While there aren’t as many tools crucial to the work of being a sommelier (beyond cramming a literal library of knowledge in to your head), there are a few that are quite important. Much like the bartender needs a proper shaker, mixing spoon, and shaker, there are core items needed in the service of beverages which are as follows. I’m not sure how this little type of corkscrew got its name as it should really be called, The Sommelier’s Eternal Lover because seriously, if you haven’t fallen asleep/passed out with one of these on your person, then you’re probably not a wine professional. I have a pile of them. Most wineries, bars, and probably high-end brothels seem to make a branded one these days and all with the crucial articulating arm that allows you to easily pull a cork as opposed to grunting like a constipated rhino. The gifted ones I’ve received are all generally the same, made by Pulltex or some knock-off imitator. But, one day in a box of bottle samples from Finca Tobella there was a bright pink corkscrew which ironically has turned out to be the best one I’ve ever used. So, while milling about Amazon one Grenache-fueled night, I came across the corkscrew you see above. It was something like $90 originally but had been discounted to $25 which naturally made it irresistible. It looked nice and beckoned me with its wood handle so I thought I’d give it a try. Now that I have it, I’m quite happy with it. It’s machined-well, doesn’t wobble and has a very long handle for my ridiculously large hands that make anything short of a magnum look puny. I have a difficult relationship with this two pronged bottle opener. There was one of these in my childhood home as well as a quite crappy non-articulated waiter’s friend for opening bottles. The Ah-So had rusty prongs, didn’t work well, and was always this evil looking thing at the back of the utensil drawer that looked poised to give you tetanus. Naturally, I’ve come around to these openers which is why I finally had to buy a proper one. The cheaper ones have prongs that are too thick and cause more problems than they solve such as pushing the cork in to as opposed to pulling it out of the bottle. On the solving problems side of things are bottles such as these archived Mas Estela wines. Beautifully elegant wines these days but with corks that crumble like a desiccated Roquefort when you try to open them. This solves that problem by extracting the cork without problems. Suffice to say, it’s a critical tool for a specific job when it comes to opening wine and you need to have one, although make sure to oil up the prongs every now and again. There are of course polishing cloths, decanters, bottle baskets, and matches for when you do things like extremely elegant decanting but these are all advanced items that don’t come up in daily use. About the only thing I think you need to have next to the Waiter’s Friend at all times is a good, reliable pen as you often need to write something down more than you need to open. 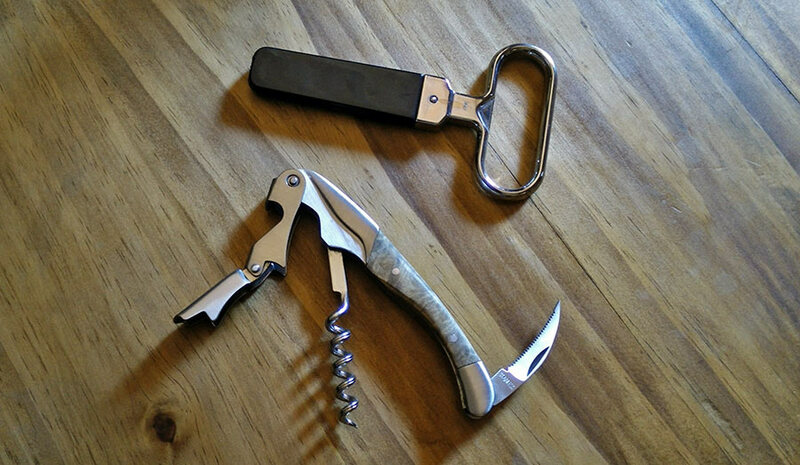 Quick question – what is the brand of the corkscrew in your photo? It’s lovely. Thank you! It’s one by “Vinium” but I bought it on a close out and it seems to be out of stock no matter where you look on Amazon or what have you. I have however seen them in some Californian wineries as their tasting room corkscrew so I almost think there is some other company behind it. Unfortunately don’t know which one but I’m quite happy to have bought it two years ago when I did!